With two unexpected events that occured within the past two months– my grandma’s passing, and my brother’s wedding reception date set– I felt like I’ve been ripped away from what I’ve always known and thrown into the deep. While one is a cause for mourning and the other celebration…neither of those events did I ever expect to happen now. I felt like I foolishly treated time like an infinite resource. It wasn’t that it never crossed my mind… it just came from nowhere. I thought there would be years left. Because that’s what we always think. Nobody knew. I showed my love, but I didn’t take advantage of time. There was just a chaos of unanswered questions inside of me, of hypothetical what ifs, of blindly trying to find fault, of anger and frustration and grief and always ending up at the same place, with the simple wish that it would all go away and for her to just be here. And to have that be impossible… how can that be reality? I wish I could say that baking had been therapeutic for me, but in all honesty, I was (am?) just uninspired and apathetic. In a rut. A soul-hurting rut. A heart-breaking rut. A painful rut. But to my surprise, it’s the current of life that’s getting me out of it. The same one that threw me in. 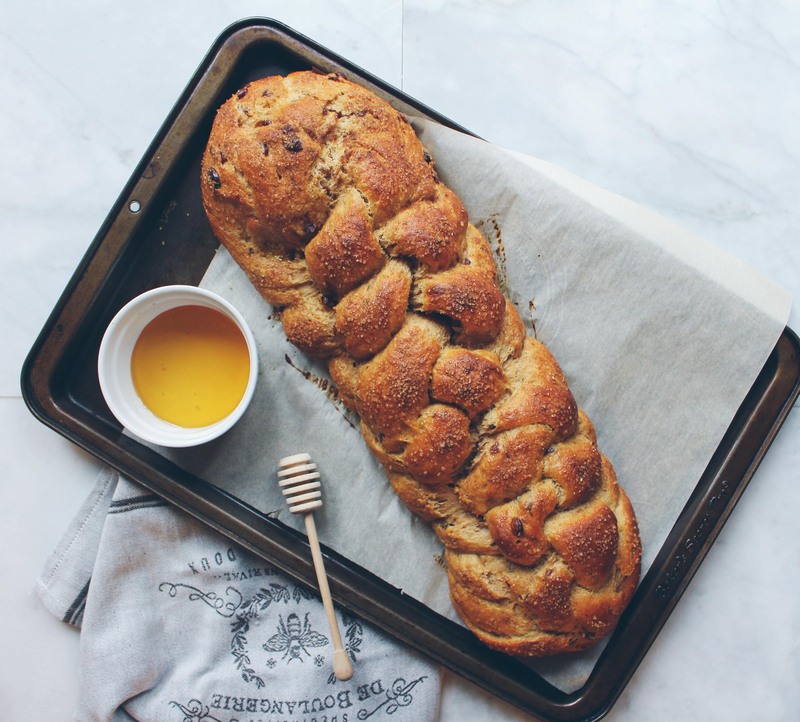 Challah is something I’ve always wanted to try baking. I had my first taste at a bread bakery in New York, before I knew what it was. I was drawn to the pretty braid and the glossy exterior, but ultimately fell in love with the texture and egginess of the bread. And, like always, it made me want to recreate the challahs (and the brioches) that I’ve tasted, but I haven’t been cutting it so far. 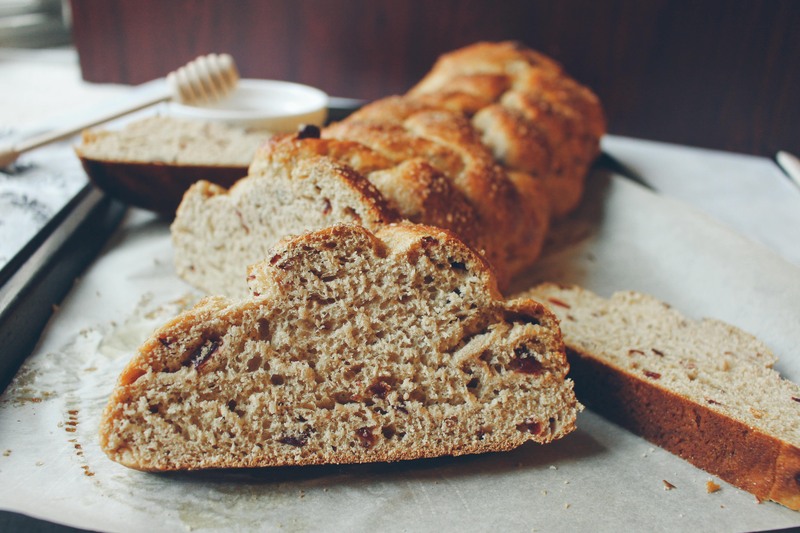 Regardless, it’s hard to go wrong with a cranberry studded loaf. I used an all purpose/whole wheat/flax seed blend, and sprinkled the top with demerara sugar mixed with spices (cinnamon, cardamom, nutmeg). There’s also a double egg wash, which was supposed to help with a glossier sheen, but I think brushing it after baking with melting butter would’ve also helped (which I skipped). 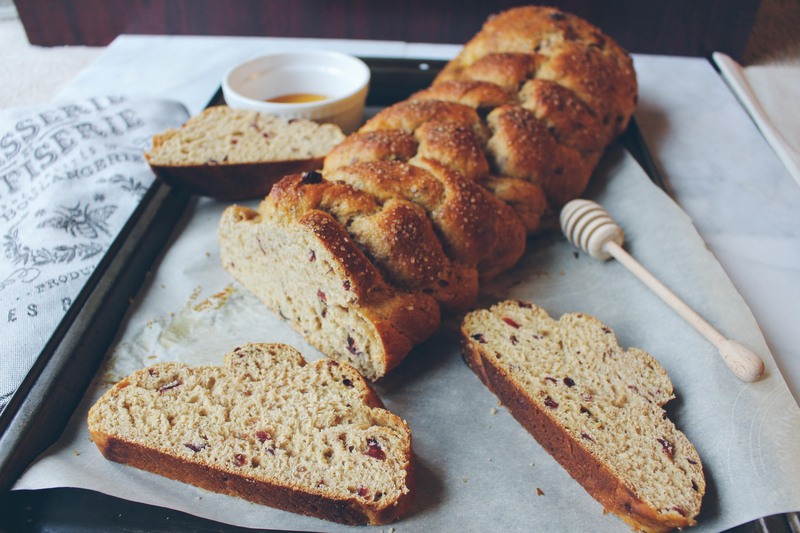 Or actually, thinking about it now, glazing it with honey would most definitely give it a nice glossiness. Plus, it makes pretty cloud-shaped french toast the next morning. Egg wash: 1 whole egg + 1 tbsp honey. In the bowl of mixer, add 1 tbsp of granulated sugar into the warm water. Sprinkle yeast over, and allow 10 minutes for yeast to wake up (bubble). Beat in honey, oil, 2 eggs, and salt. Add the flour 1 cup at a time, beating after each addition. Add the cranberries, if using. Switch from paddle attachment to the dough attachment when the dough gets too stiff to beat with the paddle. Knead for 30 minutes (I’m not kidding, it actually makes a difference). The dough should form a smooth ball that slaps against the side of the mixing bowl. Cover with a damp, clean cloth and let rise for 1.5 hours or until the dough has doubled in bulk. 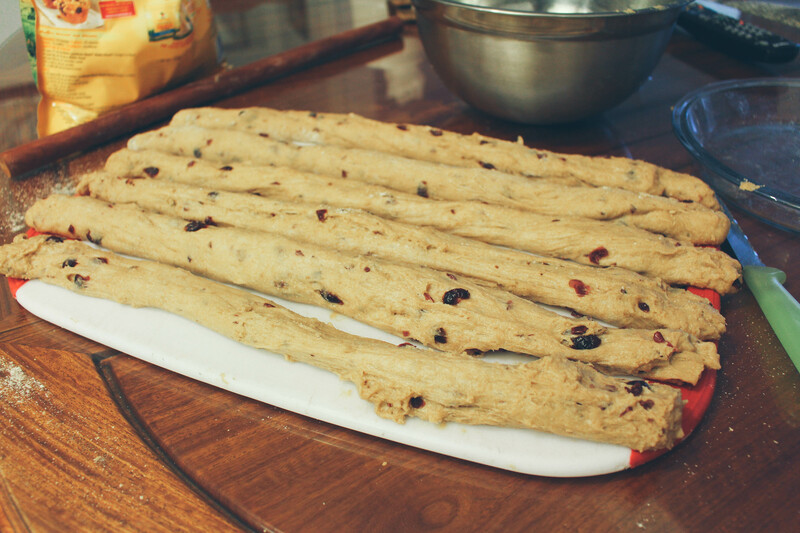 Punch down the risen dough and turn onto a lightly floured board. 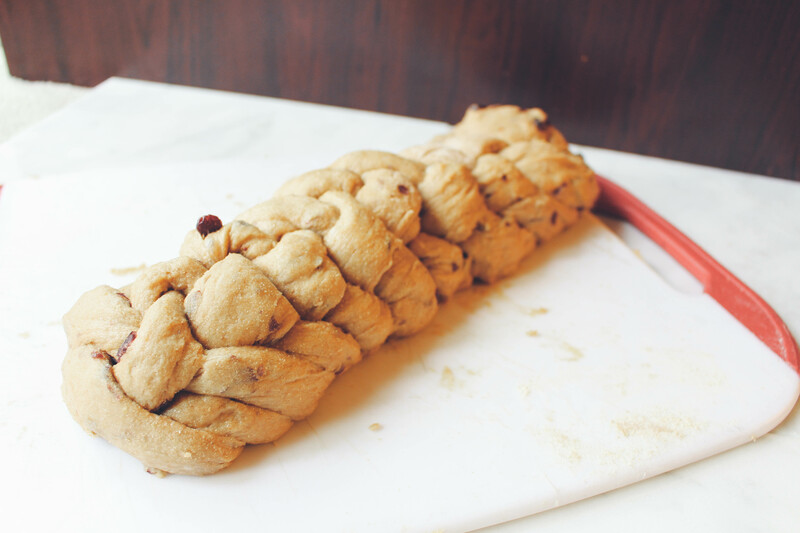 For a six-stranded braid: divide in half and knead each half for 5 minutes, adding flour as needed just until it’s no longer sticky. Divide each half into thirds, and roll into a long snake. Roll the ends of the log narrower in diameter. Now, watch this to see how to braid it. Wasn’t that fun? 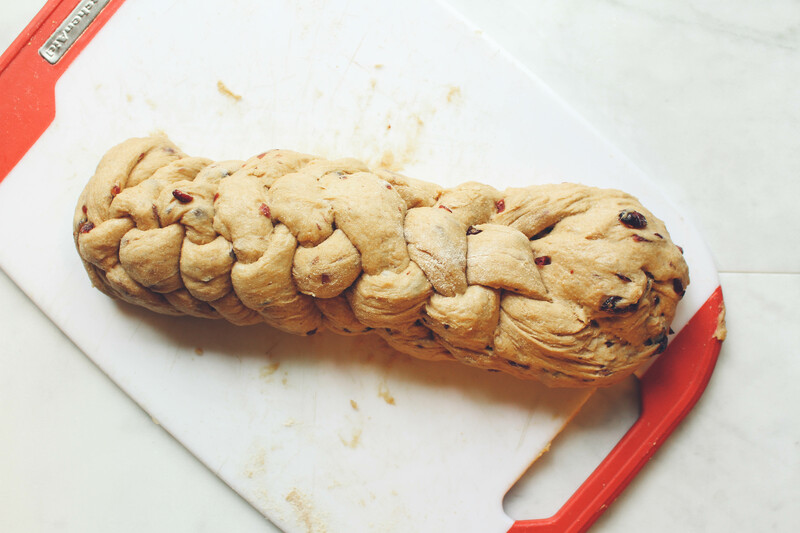 Place the finished braid onto a large baking tray lined with parchment paper. For the egg wash, beat the egg and honey together. Brush over the braid. Set the egg wash aside for later. Cover with a towel and let rise for an hour in a warm place. Preheat oven to 375°F. Place another large tray on the lowest rack. Brush a second layer of egg wash onto the braid. Combine the demerara sugar, cinnamon, nutmeg and cardamom. Sprinkle the top generously. Working quickly, open the over door and pour enough cold water onto the tray on the bottom rack just until its entire surface is covered. A bunch of steam is going to billow out, be careful. Place the braid on the middle rack (mine’s on level 4). Turn down the oven temperature to 350°F. Bake for 30 minutes. Mine was perfect at exactly 30 minutes, but since oven temperatures vary– it should “sound hollow” when tapped, which I know is one of the least helpful tips in the bread baking world. Sorry. Another way you can figure out if it’s done or not, is stick a toothpick into the thickest part and use your judgement to “feel” the crumbs by doing this, and seeing if it feels dense at all, or if you just feel light crumbs. Cool on a rack for at least an hour before enjoying. 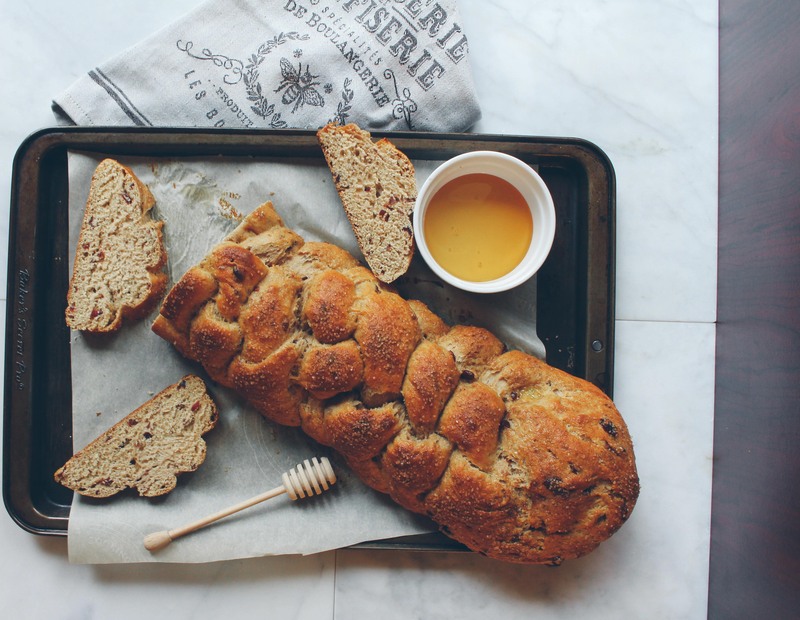 for a glossy finish, skip the demerara sugar topping and instead drizzle a generous amount of honey right after the loaf comes out from the oven. for a crust that’s guaranteed to stay soft, brush melted butter alllll over the loaf right after it comes out of the oven. my loaf actually tasted bitter, which kind of lowered my bread-baking-esteem a bit, but I suspect it came from the extra virgin olive oil I used. Who knows. I’m not sure if the whole creating-steam-in-your-oven actually made a noticeable difference versus the regular way, but from what I’ve read, the high heat in the beginning + the moisture allows the bread to quickly rise before a hard crust develops over top, which would make it harder for the bread to expand. Oh gosh, this was such a lovely and thoughtful post. I get very nostalgic about the oddest things, but I haven’t really ever undergone such upheavals as you have, and especially not two in close sequence, so I can only imagine how that must be. 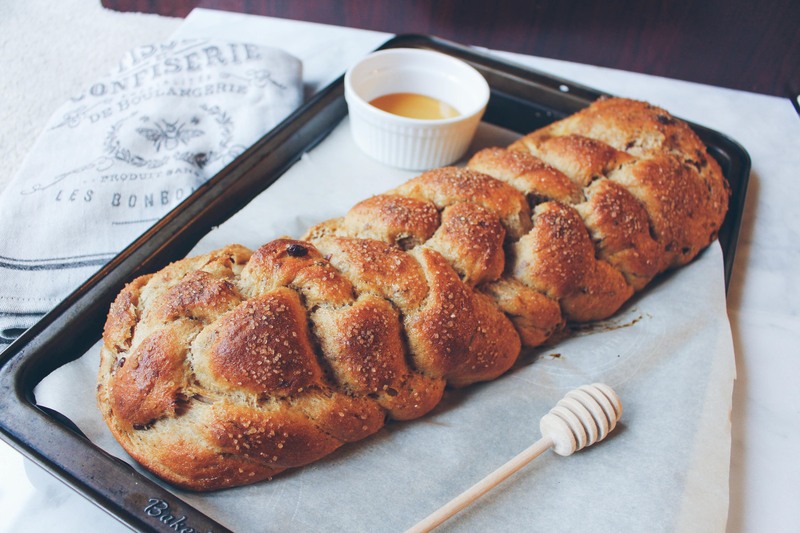 What a pretty challah–the cloud shape is so cute! I’ll take that as quite a compliment coming from you and your wonderful blog! !